There are many digital magazines available already, but Adobe Digital Publishing Suite takes it beyond a magazine able to be read on a digital reader, and turns it into an interactive experience that unleashes the potential that high quality journalism has always has, but has more recently been out-gunned by cowboys in the wild west frontier of websites. Whilst trolling the globe via the virtual pedestrian path that is Portuguese internet connection I stumbled upon this gem left at the side of the road. COULD THIS BE THE ANSWER? But after watching a variety of videos on ADOBE.TV regarding the brave future of digital publishing I am seriously reconsidering my reservations as I think there is incredible potential within our little world of bicycles. Supposedly the print media is in decline (although biking publication sales are actually being very robust in comparison to wider print industry), and websites seem to be taking more and more share of advertising revenues (despite having very little quality content that, arguably, doesn’t lead to creating and maintaining an audience with actual spending power. But more about certain websites and their pursuit of 75% good enough at a later date), maybe it’s time to reassess the options in light of more changing mediums and the container they can be carried in. Firstly, it has to made clear this is more than just the same old magazine being made readable in digital form, this is a whole new way of interacting and experiencing a magazine. Magazines have always had a very strong brand image and aesthetic, something that has not converted well over into websites. Website technology is still very restrictive in the lay outs, typography and styling, and as a result most on-line articles on magazines websites just don’t pull off the same impact as the original print version. Take for instance, Dirt Magazine which has a very strong identity and style. It would be very hard to mistake Dirt with any other mountain bike magazine. Dirt has always taken immense pride in very brave, radical and original layouts for the magazines content. But on a website it is almost impossible to pull off the same layout due to the limited layout potential of html. The freedom of creativity is lost and content all ends up looking the same, or near enough. 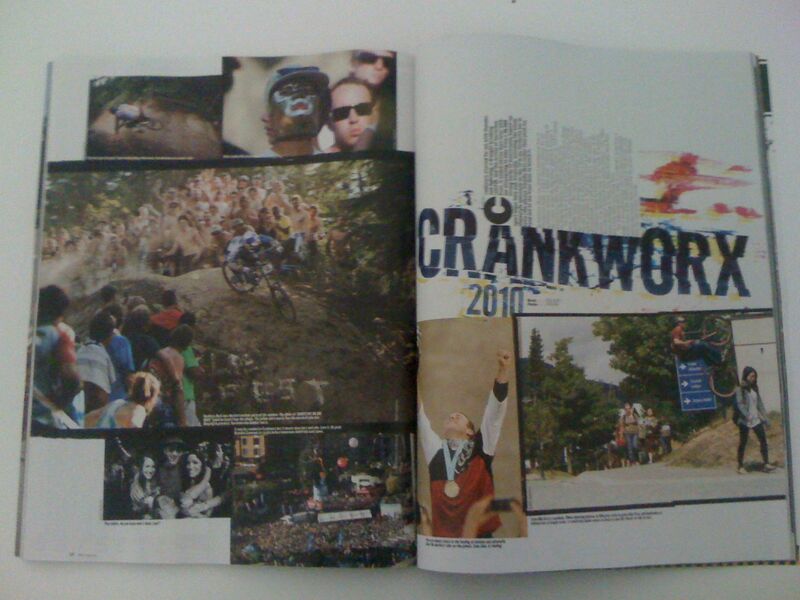 Take for instance the Crankworx photo essay from Dirt 104. Photos over laid upon one another in a more free range montage format, something very hard to pull off on a website. And yes, digital magazines like International Mountain Biker, Freehub or WideOpen do already exist, and most print magazines you can purchase on-line and read digitally already, but what if you could take that digital magazine and interact with it, play moving pictures and have even more freedom with layouts? Imagine the above Crankworx layout, and as your finger scrolls across each photo a video file of that image begins, or an audio file of the crowd cheering plays, or even being able to scroll the photo itself to access a panoramic view of the scene at Crankworx? Well thats the difference this Adobe Digital publishing will make. I will leave you to troll through the videos from the above link to Adobe TV and see for yourself what this technology means, but below I have summarized just some of highlight to mountain bikers for embracing this technology. And if someones doesn’t soon, I will be the first. Anyone smell the Cooperative burning silicone? Statistics. With this technology it allows the publisher to look at detailed charts and statistics about what is being read, how it is being read, what is the read flow. etc. This is something that is very hard to accurately do with print magazines and should lead to publishers being able to generate the most appropriate content for the reader in the mid to long term, and provide sales guys more ammunition when selling ad space. I can imagine the sales guys at Factory Media, “Hey come on Sony, you guys need to buy the page opposite Seb Kemp’s Whistler Diaries column this month, for the previous six issues his page has been the most read one pager in the magazine. It’s prime real estate next door dude.” Well we can all dream right? Interactivity. No longer will there exist a metaphorical glass barrier between the reader and story contents. Now readers will be able to touch photos and call up detail and expand information on-demand. Photos can also be more immersive where the viewer can journey around in them. Imagine a bike review where the reader scrolls over a photo of the bike on test and technical details spring up around image, or where a moving image file of the bike in action begins. Or how about on a travel piece the reader can scroll a photo to get a panoramic view of the place, including tags and details that spring up in the image. For instance it could be a giant panoramic picture of the Chilcotin’s which mesmerizes the viewer, or a map of the area where the details that correspond to the written article pops up. Hotels, bars, trail heads etc. Moving images. Melding of stills and moving picture. How about a cover that isn’t just of a rider roosting a corner, but where the rider moves and the roost appears to fly out of the screen. It seems more and more often videos are taking over the internet websites, each day amazing videos are born and then die. Nothing lasts and even incredible videos are lost and forgotten minutes later. SO what if videos can be allowed to live and breath forever within the magazine? Imagine a Dirt 1:04 article where the an image in the layout is actually a freeze frame from a 4 minute long video of the whole day? Dirt produce these videos already for use on the website to act as a cross platform marketing tool, so why not integrate it into the magazine forever? Brand identity and aesthetic. I’ve talked about this already so I wont go on. Archival. With digital you have the ability to download old issues and retain a personal library of issues. It might not be a stack of magazines on the coffee table or next to the toilet, but you can virtually possess your whole collection. I could be entirely wrong, but this eradicates a huge cost of printing the physical magazine, both to the publisher and the environment. Wired magazine say their first digital magazine sold 100,000 copies which is more than the news stand did, but most importantly it didn’t cannibalize sales of the news stands at all. So that is 100,000 extra copies that didn’t actually printing. Printing costs money, shipping the magazines costs money, and getting the right distribution network costs money. I live my whole life scouting around and it is very hard to find copies of my favorite magazines because they aren’t widely available in some countries, but with digital I could get them any where anytime. Furthermore, there maybe the cost of digitizing the magazine and distributing on the web, but surely thats not as large as the cost of producing and shipping the physical magazine, which is a huge potential saving to the publisher. I could be entirely wrong, so correct me if I am, but many magazines cover cost is just to cover the physical costs of the magazine, and advertising revenue within the magazine is what creates finance to produce the contents. So if the cost of physical magazine (printing and shipping) is eradicated, or drastically shrank, then does this not create the potential to either increase profits, or sell magazine for a nominal fee and thus attract a larger readership? I don’t know, maybe I’m wildly off with that, but that’s how I see it at face value. Tablets and readers. Are they becoming popular enough in mountain biking circles? Yes, eventually. At the moment I believe the older market are the only ones with the income to purchase these reading devices, which is perfect, as this is the same market with funds to buy expensive bike parts. Bingo for marketeers surely as this is the market they want to target. Well unfortunately it does miss out on other parts of the market like younger kids, but this younger market are the ones most accepting of digitalization of their world. They have been brought up in it and it is normal, hence why websites have have had such an explosion. Websites are just the zine for the youngest generation. We used to savor each magazine and wait desperately for each new issue to arrive at the news stand or on our door, nowadays I wonder if that magic experience has diminished. 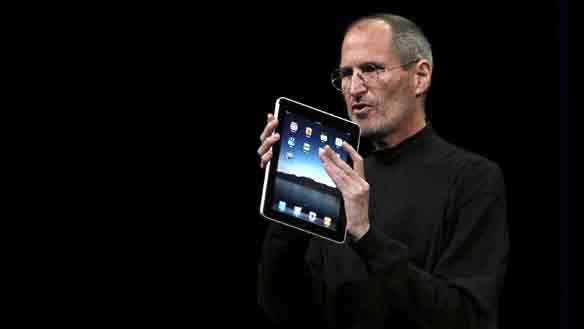 As devices become cheaper and more widely possessed then it could be a perfect time to offer a quality digital experience with depth and story to the younger market who have so far only been fed fast and un-nourishing McDonalds in the form of websites. Websites. 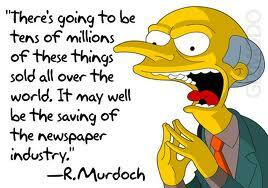 Of course websites can’t be beaten for up to date news and information, so leave them to it. However, despite what some plebeians there is still a huge slice of the market who really do value beautiful stirring pictures, well written engaging stories and relevant artistic layouts. Magazines should continue to utilize websites as a complimentary addition to the overall product of the magazine experience. Rather than seeing websites as a necessary evil, forced upon time starved journalists by demanding boardroom stir crazy executives, websites should be integrated into the overall package of the magazine. With this technology websites could have links to direct articles within the magazine issue, or vice versa. The magazine could still have a news and events page like in days gone by, but instead it could be a self-updating scroll of recent news that appears more like a ticker feed. However to keep authentic, the news and events page could be archived so the first view is of the news from the same month that issue of the magazine appeared on virtual news stands, then with a finger tap it updates to current news via the magazines website for example. Anyway, I hope this has sparked some ideas. If you have any comments or additions or want to simply begin a conversation on this matter then hit me up in the comments field, leave your email address and we can begin. NOTE: I have had to add this note in the light of some peoples comments. Thank you to everyone who has emailed or commented. However, I desperately want to make one thing very clear. I was not advocating internet magazines. I was talking about digital magazines. Something read on a digital portable reader like the I-Pad and not something read on the internet on your computer at home or in office. Sure, the magazine is downloaded from the internet, but thats it. It is not a website, or just a pdf linked to a website. It is a magazine that can be read anywhere just like a magazine, all be it on a different container. ← SPELL OF THE YUKON. Good read, and really interesting. Magazines surely need to become things of beauty and something that is kept and admired, like a good art book. Better quality paper and binding, and a larger emphasis on things a web site could never do justice to. I’ve bought every issue of Dirt since number one, I was obviously a lot younger back in 1996, but I still had all those magazines till about 2004, when they just had to go. And the trend of chucking magazines away, into recycling of course, after a few months hasn’t changes for me. Has the internet had something to do with this, maybe? Probably, but I still buy most of the mags, due to my job, but the only ones I keep are the arty ones like Juxtapoz. Back in the day, Dirt was the only contact anyone could have to gravity biking, now there’s Pinkbike! Internet sites do lack the creative flair the magazines have, its just not feasible, I know because I’ve recently set up my own site, and was something we wanted to try and do. Its early days for us and indeed, if the technology your talking about becomes the norm, who know where it will go online publications and regular web sites. Dan Barnham had a post on his twitter asking whether preference was for video or for photos. Whilst a video provides you with a whole lot more information and an insight into the atmosphere at an event a good photo can hold your attention for a lot longer. Photos from video shoots will remain in my head for longer than the videos they were taken from. I don’t think there will ever be a time when people will have screens showing videos on their walls in place of pictures. Combining the two for the ultimate internet magazine may provide the ultimate “info-tainment” experience but there is something about picking up mag and leafing through it which can not be captured by a web version. Maybe I’m just showing my age though having grown up with mags rather than you tube.